Save time, while taking in the beauty of Lake Champlain, The Lake Champlain Ferries and Ticonderoga Ferry provide several connections to New York destinations like Plattsburgh, Port Ken, Essex & Ticonderoga. There are four ferry crossings to get you to your destination (saving you a farther drive to cross by bridge). Fares are less than half the cost when you cross on foot and get a ride on the other side. Some ferries don’t operate in the winter or on holidays so make sure to check your travel dates against ferry schedules. Fares can vary based on whether you travel alone or with other passengers, and whether you travel by car, bike or on foot. Contact the ferry provider for details on discounts and advance purchase tickets. Look up ferry details like how long it takes to cross, as well as the board and departure locations. If you haven’t used the ferry before, call the service provider or go online to get more information. Once there, just sit back and enjoy the beautiful views of Lake Champlain! 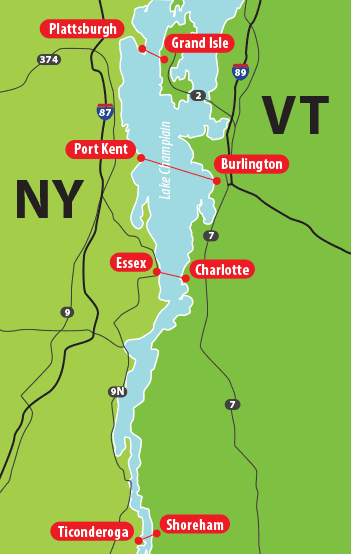 Lake Champlain Transportation offers three crossings, the Inter-State Connection from Grand Isle, VT to Plattsburgh, NY; the Scenic Line from Burlington, VT to Port Kent, NY; and the Southern Crossing from Charlotte, VT to Essex, NY. Cross Lake Champlain between Ticonderoga, NY and Shoreham, VT, connecting the Lake George and Adirondack regions of New York with the Middlebury and Central Green Mountain areas of Vermont. Docks are located in It Ticonderoga, NY and in Orwell, VT and in Shoreham, VT. Note: Be sure to check websites for seasonal schedule changes. Connecting you to more travel options throughout Vermont. Statewide road conditions, delays and closures. A comprehensive guide to saving fuel and energy.